All levels welcome - regardless of fitness we can accommodate you. Coming soon - Aerial Yoga classes at Up in DC yoga studio in Silver Spring. Inversion - release the spine with gravity. Beginners and experienced alike can benefit from the release of aerial yoga. Aerial yoga has made me feel young again. It feels playful when I am in class and I feel weightless, kind of like I am flying with great strength supporting me. I am able to get into poses and deep stretches that I can not do in other forms of movement. I highly recommend giving it a try trusting yourself and the strength within you to try something challenging and new. 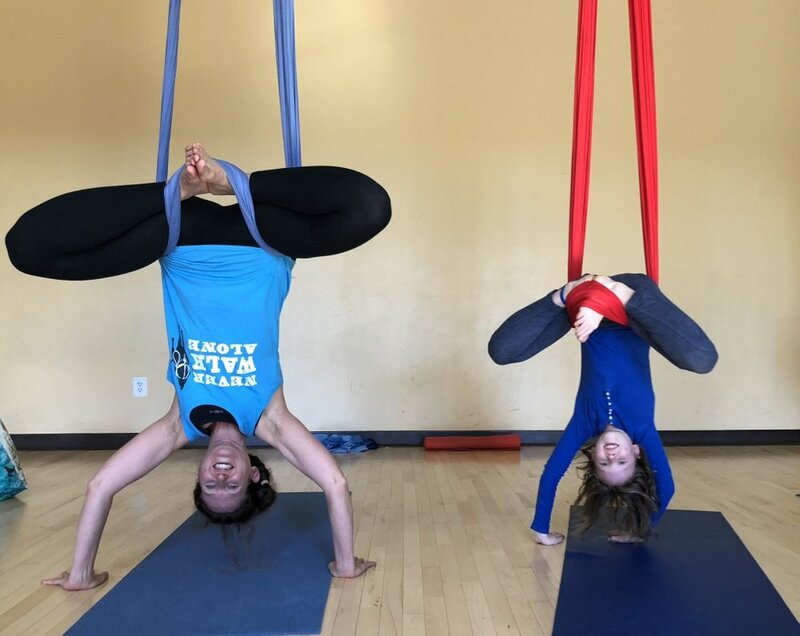 Parent and child aerial yoga classes held monthly at Upspring studios At Joes Movement Emporium.